A PROPOSED eight-storey apartment complex on Wren St, Mt Pleasant has drawn praise for its design after being approved by the Metro Central Joint Development Assessment Panel (JDAP). The $40 million development was approved on Tuesday unanimously with panel members praising its design, which includes 47 apartments, public artwork and a rooftop garden. Presiding member Megan Adair said the development was a good example of the City of Melville, its Design Review Panel (DRP) and the applicant working together. 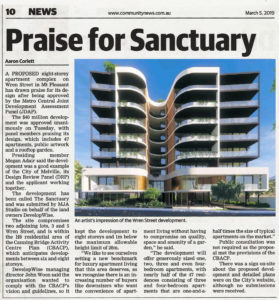 The development has been called The Sanctuary and was submitted by MJA Studio on behalf of the land owners DevelopWise. The site compromises two adjoining lots, 3 and 5 Wren St, and is located within the H8 residential area of the Canning Bridge Activity Centre Plan (CBACP), which anticipates developments between six and eight storeys. DevelopWise managing director John Woon said the organisation wanted to comply with the CBACP’s vision and guidelines so they kept the development to eight storeys and 1m below the maximum allowable height limit of 26m. 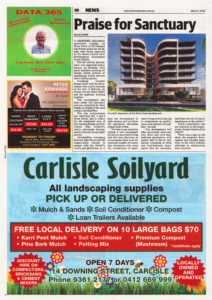 “We like to see ourselves setting a new benchmark for luxury apartment living that this area deserves, as we recognise there is an increasing number of buyers like downsizers who want the convenience of apartment living without having to compromise on quality, space and amenity of a garden,” he said. According to the meeting agenda, public consultation was not required as the proposal met the provisions of the CBACP. There was a sign onsite about the proposed development and detailed plans were on the City’s website, although no submissions were received.